A record 11.2 million Latinos voted in the 2012 presidential election, but Latinos’ voter turnout rate continues to lag other groups significantly, according to an analysis of new Census Bureau data by the Pew Research Center. Rapid growth of the nation’s Latino population has fueled quick growth in the number of Latinos eligible to vote (U.S. citizen adults). 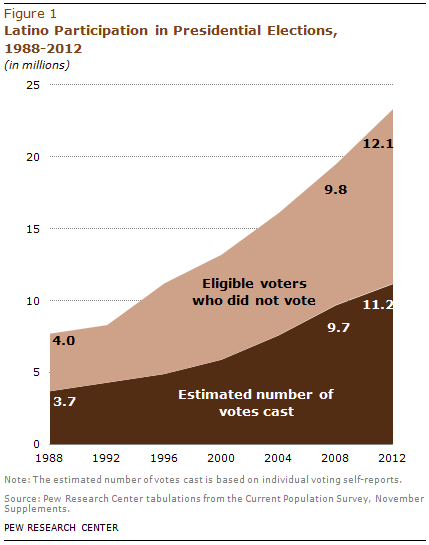 Between 2008 and 2012, the number of Latino eligible voters grew from 19.5 million to 23.3 million—an increase of 19%. By contrast, the number of Latino voters increased by 15% over 2008. With the number of Latino voters growing more slowly than the number of Latino eligible voters, the Latino voter turnout rate declined between 2008 and 2012—despite a record turnout. The Pew Research analysis also finds that the Hispanic voter turnout rate declined for nearly all major Hispanic demographic subgroups with the exception of three. The voter turnout rate of naturalized Hispanic immigrants who arrived in the 1990s increased from 41.2% in 2008 to 47.2% in 2012. Among Hispanics ages 65 and older, the voter turnout rate increased from 56% in 2008 to 59.9% in 2012, mirroring a similar increase among all eligible voters ages 65 and older. And among Hispanic origin groups, the voter turnout rate of Puerto Ricans increased from 49.7% in 2008 to 52.8% in 2012. The analysis also finds that voter turnout rates differed widely among Latino demographic subgroups. In 2012, the highest voter turnout rates were among those with a college degree (70.8%) and among Cuban-origin Latinos (67.2%). Meanwhile, the lowest were among those ages 18 to 29 (36.9%) and those with less than a high school diploma (35.5%). Latinos were also a larger share of the nation’s electorate in 2012, making up a record 8.4% of all voters, up from 7.4% in 2008. However, while 11.2 million Latinos voted in 2012, an even greater number—12.1 million—chose not to vote even though they were eligible to do so. Overall, among the nation’s 82.1 million nonvoters in 2012, 15% were Latinos. Much of the growth in the number of Latino eligible voters was driven by Latino youth. Among the 3.8 million Latinos who became eligible to vote between 2008 and 2012, 3.7 million were U.S.-born young Hispanics who entered adulthood. Annually, about 800,000 U.S.-born young Hispanics come of age, making them newly eligible to vote (Taylor, Gonzalez-Barrera, Passel and Lopez, 2012). The number of Hispanics who say they were registered to vote in 2012 reached 13.7 million, up 18% over 2008. That was also a record. 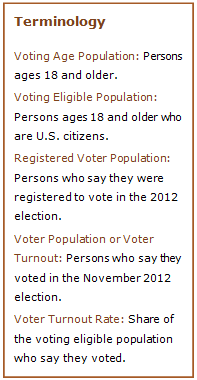 However, the voter turnout rate among Hispanic registered voters was lower in 2012 than in 2008—81.7% versus 84%. Overall, Hispanics made up 17.2% of the nation’s population in 2012, 10.8% of eligible voters, but just 8.4% of all voters. Much of this difference is driven by the relative youth of the nation’s Hispanic population and the high number of non-citizen adults among its population (Taylor, Gonzalez-Barrera, Passel and Lopez, 2012). Just 43.9% of Hispanics are eligible to vote while more than half (51.7%) of Asians, 69.1% of blacks and 78.6% of whites are eligible to vote. In 2012, Latinos supported Barack Obama over Mitt Romney by a margin of 71% to 27% (Lopez and Taylor, 2012) and were an important part of the coalition that re-elected the president. As the electorate diversifies—with Latinos accounting for much of that change—the importance of the Latino vote will likely grow (Taylor, 2013). The U.S. electorate reached several milestones last year. According to the Census Bureau, 2012 was the first time that the black voter turnout rate1, exceeded that of whites (File, 2013), though there is some skepticism about when or if the black voter turnout rate surpassed the white voter turnout rate (Taylor and Lopez, 2013). In addition, the number of white voters declined for the second presidential election in a row, leading to a decline in the white voter turnout rate. One other finding from 2012 is the decline in the youth voter turnout rate. According to an analysis by the Center for Information & Research on Civic Learning & Engagement, the voter turnout rate among those ages 18 to 29 declined from 51% in 2008 to 45% in 2012 (CIRCLE, 2013). 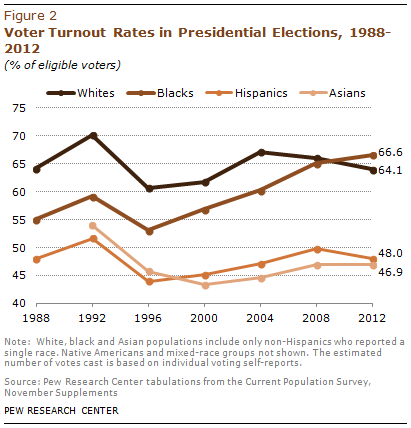 This report summarizes the participation of Latino voters in the 2012 presidential election. 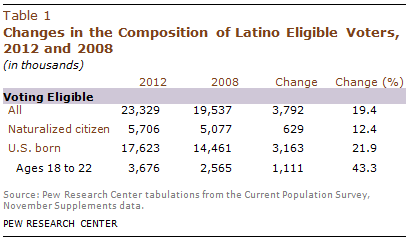 Its appendix contains tables and figures about the electorate in 2012, with a focus on Latinos. The data for this report are derived from the November Voting and Registration Supplement of the Current Population Survey (CPS). The CPS is a monthly survey of about 55,000 households conducted by the Census Bureau for the Bureau of Labor Statistics. It is representative of the non-institutionalized population of the U.S. It does not include data on the voting behavior of enlisted military personnel and those who are institutionalized. The November Voting and Registration Supplement is one of the richest sources of information available about the characteristics of voters. It is conducted after Election Day and relies on survey respondent self-reports of voting and voter registration. The authors thank Paul Taylor for editorial guidance. Danielle Cuddington checked numbers in the report. Molly Rohal was the copy editor. The terms “whites” and “blacks” are used to refer to the non-Hispanic components of their populations. “Foreign born” refers to persons born outside of the United States to parents neither of whom was a U.S. citizen. Foreign born also refers to those born in Puerto Rico. Although individuals born in Puerto Rico are U.S. citizens by birth, they are included among the foreign born because they are born into a Spanish-dominant culture and because on many points their attitudes, views and beliefs are much closer to Hispanics born abroad than to Hispanics born in the 50 states or the District of Columbia.